Fieldbook is an information tool that lets anyone create a database, as easily as a spreadsheet. Our aim has always been to be more user-friendly than any database and more developer-friendly than any spreadsheet. Today we just got a lot more developer-friendly, with the launch of Fieldbook Codelets. A codelet is a snippet of code you upload to a Fieldbook that creates a new API endpoint for the book. You can send HTTP requests to this endpoint, and your code generates the response. … That’s it. No, really. There’s no need to host a server. Normally a Slackbot or a webhook handler would require a separate Heroku app or something even more cumbersome. Codelets host the code for you. There’s no boilerplate code to write. No webserver to initialize, no middleware stack to configure, no parsing or serializing. Just write the code that matters. Your Fieldbook data is at your fingertips. Each codelet is given a pre-initialized Fieldbook API client object, so reading or writing the data through our API is a one-liner. Check it out in action on this book. Then sign up to make a copy and tweak the data and code yourself. At Fieldbook, our mission is to create the world’s best tool for working with structured information. We believe no one should have to settle for tools that don’t truly fit them, just because of the overhead of operations and boilerplate code. Fieldbook Codelets are one step on the road to eliminating those barriers and delivering custom information tools to everyone. We can’t wait to see what you do with it! 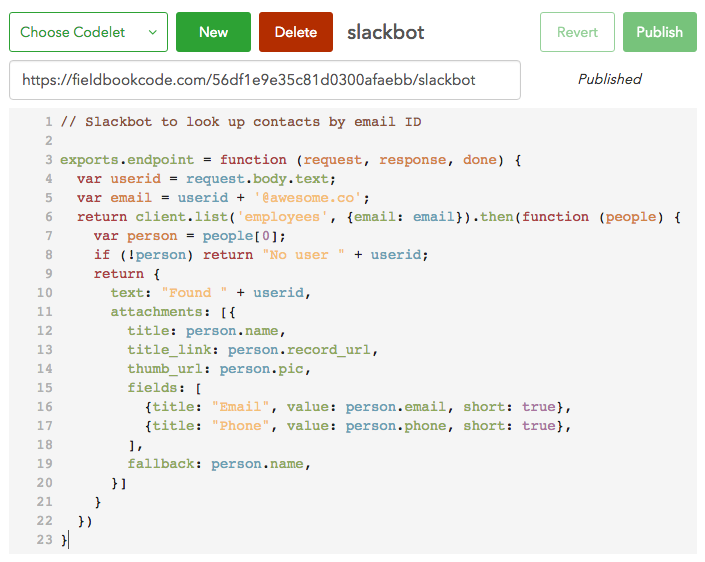 Fieldbook lets anyone create a database, as easily as a spreadsheet.